Part of an eye exam is measurement of visual acuity. Visual acuity is the clarity or sharpness of your vision. Normal visual acuity is described as 20/20 vision. That means that you can see at twenty feet what a person with normal vision can see at twenty feet. On the other hand, if your vision is 20/40, you can see at twenty feet what a person with normal vision can see at forty feet. Your vision is worse than normal. Visual acuity is determined by using the familiar eye chart with progressively smaller letters on each line. Some people can see 20/15 or 20/10, which is even better than 20/20. These people are said to have “super vision” or “supranormal vision.” One of the great advances in LASIK over the last decade has been wavefront-guided LASIK. Wavefront is a greatly improved tool for analyzing the imperfections in the eye. 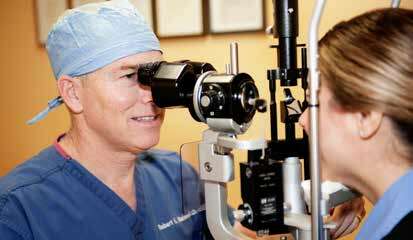 It allows the eye surgeon to achieve better than 20/20 vision in most patients. Wavefront is discussed in more detail in chapter 5 on LASIK. Numbers such as 20/20 or 20/40 describe your visual acuity but do not measure your refractive error—how inaccurately your eye bends, or refracts, light. When an eye doctor measures your refractive error, what you end up with is your eyeglass prescription. Most people correct their refractive error by wearing eyeglasses. Your eyeglass prescription is written in numbers. The type and degree of refractive error is quantified in units of measure called diopters. If you have ever wondered what those numbers mean, here is how to read and understand your prescription. OD and OS refer to the right and left eyes, respectively. The first row is the prescription for the right eye, and the second row is the prescription for the left eye. The first number in each row, next to OD or OS, represents the sphere. The sphere measure reveals whether you are nearsighted or farsighted. A negative diopter value indicates myopia, or nearsightedness. A positive diopter indicates hyperopia, or farsightedness. The higher the number, the worse the nearsightedness or farsightedness. In the example above, the person has mild myopia (–1.25 diopters) in both eyes. As part of your eye exam, your ophthalmologist will examine the internal structures of your eye to ensure that you don’t have cataracts, macular degeneration, or other diseases. If astigmatism is present, your eye doctor takes an axis measurement. The axis is the third column in the prescription. Recall that the eye is oval shaped if you have astigmatism. The axis measurement indicates the angle of the oval shape relative to horizontal. In the prescription on the previous page, the astigmatism in the left eye is positioned at an angle of 15 degrees above the horizontal. In some prescriptions, there is fourth column with the word Add followed by a number. This indicates a prescription for bifocal or progressive lenses. A “reading add” is a lens in the lower half of the glasses that provides additional help with reading when the wearer looks down. Reading adds are used in patients with presbyopia over the age of forty-five. In the prescription on the previous page, there is an extra boost of 2.00 diopters in the lower half of the glasses to allow this individual to read clearly. In general, nearsightedness of 0 to –3.00 diopters is considered mild, –3.00 to –7.00 diopters is considered moderate, and –7.00 or more is highly myopic. For farsightedness, 0 to +1.50 is considered mild, +1.50 to +3.00 is considered moderate, and more than +3.00 is highly hyperopic. For astigmatism, less than 1.50 diopters is mild, 1.50 to 3.00 diopters is moderate, and more than 3.00 is high astigmatism.